For the fifth round of the Sparkassen Chess-Meeting in Dortmund, Grandmaster Sergey Shipov commentated live on the Kramnik – Naiditsch game. 4…dxc4 In this opening the c4 pawn is regularly given up. In exchange white gets better development and long-term pressure. 7. Qa4 One of the three main paths. 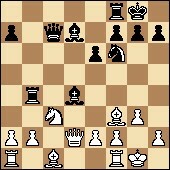 7…Bd7 8.Qxc4 The queen personally recovers the loot. At the same time black gets the chance to at least complete his development. 8…cxd4 9.Nxd4 Rc8 In any case he’s no longer suffering on the queenside, when compared to many variations in the Catalan. 10.Nc3 Nxd4 11.Qxd4 Bc5 12.Qh4 O-O And the kingside has also got there. Though the achievement does cost black a pawn. 13.Bxb7 Rb8 14.Bf3 We’ve taken a pawn, now let’s shore things up. Standing on f3 the bishop supports the e2 pawn and graciously leaves the g2 square for the king. 14…Rb4 15.Qg5 The queen here isn’t pretty, of course. But it’s not a problem. The main thing is that it isn’t lost! 15…Bd4 Black is building up serious pressure against the white queenside. The normal picture in the Catalan has been turned upside down. i.e. the colours are reversed. 16.Qd2 The more the merrier. 18. a3 But Kramnik has no need whatsoever for my advice. I’m looking at this position for the first time in my life. While he’s analysed it calmly at home. The difference is colossal. The clocks are a good illustration of the differing knowledge of the two players: 1.45 – 1.21. 18…Rc4 A man who knows his chess can’t make another move at the board. 19. Ne3 As was to be expected. 19…Ra4?! And this, more likely than not, will be something that Vladimir won’t really have expected. So it is – he’s started thinking. How transparent everything is in the play of the great and the good! Sit online with a good “piece of metal”, with decent software – and you’ll see for yourself… However, the fact that black surprisingly and on his own initiative has lost a whole tempo compared to the previous line noted can be understood even without a machine. 20. Rb1 A necessity. The b2 pawn is not only defended, but also freed up for greater matters. b2-b3 is the threat. The difference in times is becoming huge: 1.36 – 0.54. The odds on Naiditsch have no doubt sky-rocketed i.e. I wouldn’t stake a dime on his winning. 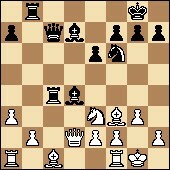 20…e5 Having once taken the decision not to exchange the bishop on d4 for the white knight, Naiditsch sticks to it. The time for general considerations has gone. Now accurate concrete decisions are essential. The thought process should be as rhythmical as a clock: “I go there, he goes there”. And so on until you get to “and things are already bad for him”. Kramnik’s lost in thought. And that’s worrying! He needed to calculate the lines before he placed the pawn on b4. Probably at that point (a move ago) he hadn’t see everything he needed to, so now he’s trying to catch up… But time won’t stand still: 1.10 – 0.51. I’ll give him a hint. White should start with 22. Qc2! 22…Qxc2 Well, well, Arkadij’s also connected. Mentally, of course. 23. Nxc2 Bf5 Tempting, but not the strongest continuation. 24. Nxd4 Exactly! This resource, and also its consequences, had to have been seen by Kramnik before he made the move 21. b4. 25…Re8 Other retreats are even worse. 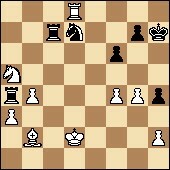 27…Bxf3 28. exf3 It’s clear that for now black has no means of freeing the rook on a4. 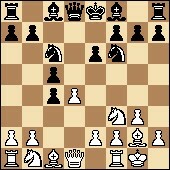 Which means that white only needs to activate his rook and, above all, his king. Then the victory will be a done deal. The general plan can be given with the notation: Kg1-b3! 28…e4 A logical desire to get rid of weaknesses. 29. fxe4 Rxe4 Here there are subtle nuances on every move, and choosing between them costs Arkadij a few kopecks – which soon grow into an evaluation that’s a full rouble against him. Now it’s all about the white king. If he can get to the queenside then the battle will be over. 32…h4 Although it’s still not so easy for white to convert his advantage, standing on the spot and calmly waiting to be put out of your misery is psychologically unbearable. Which is why Arkadiy is going for complications and thereby perhaps hastening his demise. 33. f3 Starting to drive it away. 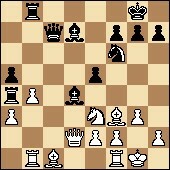 34. g4 Very subtly played. But maybe too subtly? 35. Ke2 Step two. Now the best gift for white would be a rook exchange on d2. 35…Nd7 But Arkadiy isn’t inclined to give a present to his opponent. He’s already been generous enough. 36. Kd2 Step three. The general plan that was announced for white appears to be close to fulfilment. But the last moat – the c file – will be more difficult to cross than the others. As black now has some activity. 36…f6 It’s useful to limit the bishop on b2. At the same time black’s preparing the crafty attack Nd7-e5. For example, it would work really well after what appears to be the natural 37. Re8? The clocks show: 0.24 – 0.12. 37. f4 Played with great precision and technique. 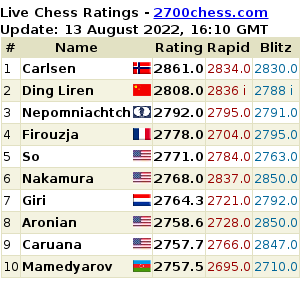 Kramnik is maintaining his advantage. 37…Nc5 An attempt to release the vice. 38. Rd4 But it turns out that it’s made of tough metal. 38…Kg6 Arkadiy is trying to bring his passive king into the game, and at the same time, it seems, he’s allowing his opponent to fully achieve the plan mentioned. However, it’s hard to find any good alternatives. 39. Kc3! Kramnik is accurate and merciless. Black’s discovered checks are as harmless as an envious glance. The white king will make it to the queenside after all. 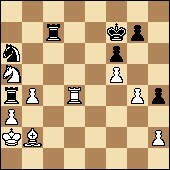 After that the pawns on a3 and b4 will advance on their own accord. 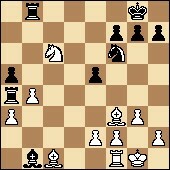 40. f5 The control move was once more the optimal one. Black can’t escape the vice-like grip. 40…Ne4+ 41. Kb3 Nc5+ No, there’s not even a hint of perpetual check. It’s just a means of prolonging the pleasure of sitting at the board. 42. Ka2 Of course. It’s only important that the king has arrived in the appropriate area of the board. Black can only delay, but not prevent, the advance of the white pawns. Now there’s no longer any need to keep the knight on a5. After it moves away the black knight will also have to abandon the c5 square. 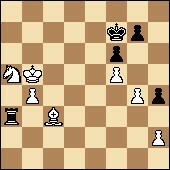 Then the white king will move to b3, and… Black’s position is hopeless. 43. Rc4 Exactly! The point is that white wins material after 43…Nxb4+ 44. Kb3. The cowardly withdrawal of the king to b1 would have seriously extended the game. While no doubt the players are hungry. It’s time to bring the struggle to an end and go and have some dinner! 43…Rxc4 Played after a painful half-hour think. I suspect that the majority of that time wasn’t spent by Naiditsch on the current position! He was recalling the position after the opening and trying to work out where he went wrong… That’s entirely typical in bad endings. Chess players who know what they’re doing always sense well when it’s no longer possible to alter the way things are going. 45. Na5 The door has again been slammed shut. The rook is threatened with capture. 45…Na6 The saviour is rushing to the rescue. But its efforts won’t be enough. 46. Kb3 Nc5+ 47. Kc4 Ne4 48. Kb5 Nc3+ Die yourself, but save your comrade. So, black has nothing more than a rook for two minor pieces and a pawn. The last illusory hope is to take the pawn on h2 and promote the passed pawn to a queen. 50. 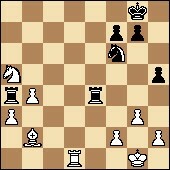 Kc4 Ra2 51. b5 But white’s always a couple of steps ahead. It’s all over.